Montreal police Chief Philippe Pichet has been suspended with pay from his duties following a damning report into the force's internal affairs. 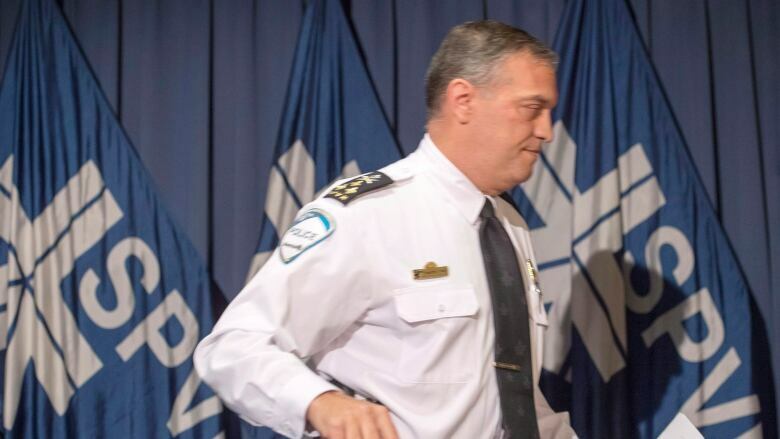 Sûreté du Québec Chief Martin Prud'homme will take over as both the interim chief and temporary administrator of the Montreal police for a one-year mandate, effective immediately. Prud'homme will take a leave of absence from his position at the SQ, during which time the provincial police force's associate director, Yves Morency, will take over his job. The decision comes after a report by Quebec's former deputy justice minister Michel Bouchard, highlighting the need to put "an end to a climate of tension and suspicion that has developed within the SPVM." A former Crown prosecutor, Bouchard has also worked as associate deputy minister of justice at the federal level. "It's impossible for the government of Quebec to remain passive, inactive, considering the gravity of what's in the report," said Quebec Premier Philippe Couillard. "The response needs to be proportional." Public Security Minister Martin Coiteux tasked Bouchard with examining how the SPVM's internal investigations work last March. Coiteux said the report, which he received on Nov. 30, paints an "eloquent and extremely worrisome portrait" of the inner workings of the SPVM and required the provincial government to take "exceptional measures." 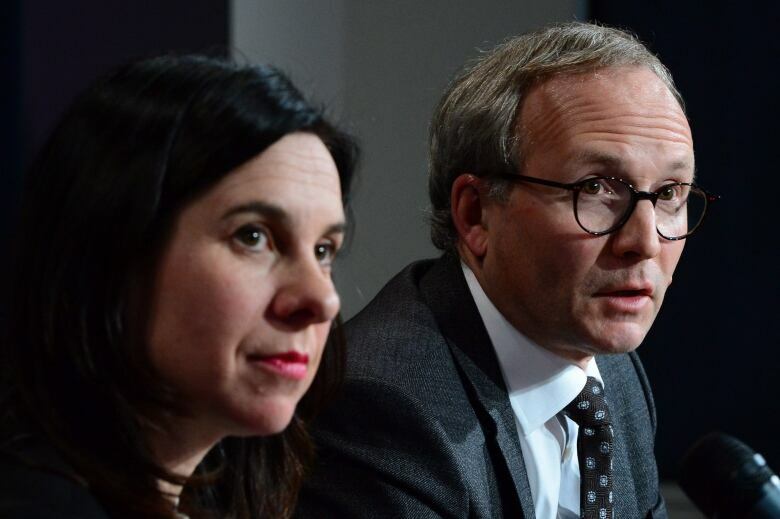 "The findings — which cover a period from 2010 until today — are troubling," said Coiteux, flanked by Montreal Mayor Valérie Plante, during a news conference Wednesday. The report covers the tenure of more than one chief, as Pichet was only appointed to the job in 2015. The report shows that several criminal allegations that should have been investigated never were, and were never flagged to the province's public security ministry as the police act requires, said Coiteux. 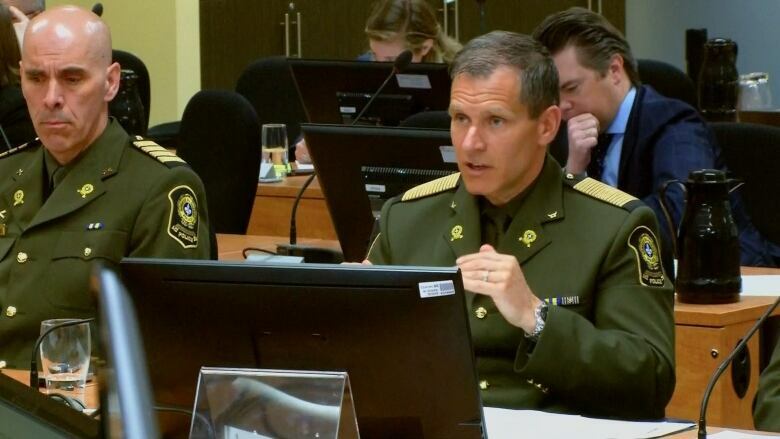 "There's a sense that in many instances, that some people within the SPVM had special treatment, others were treated differently, some investigations botched," said Coiteux. "Important information was deliberately left out of investigative reports, in order to make sure that certain police officers would not be brought before the courts or face disciplinary proceedings," he said. As part of the report, Bouchard also recommends the government revise the province's Police Act. He concludes that an "enormous challenge" lies ahead for the administration of the police force to regain the confidence of officers and Montrealers. Radio-Canada tried to speak with Pichet, but Montreal police said he was not available for comment. The report, made public Wednesday, also says there was a lack of leadership on the part of Pichet. After joining the force in the early 1990s, he was promoted to positions in operation planning and worked with the counter-terrorism unit. Pichet was also part of the team co-ordinating the police response during months of student protests in 2012. The decision to suspend Pichet was not taken lightly, said Coiteux, but it was necessary given that Bouchard's report expressed "very important doubts about the capacity" of the chief to "improve the situation" within the police service. "During our meetings with members of the Montreal police, a consensus among a large group of them was that there has been an absence of leadership shown by the head of the force in the last few years," the report said. Coiteux said Prud'homme has a clear vision of what a police force should be and "all of the necessary leadership" to implement changes. "We had to act now, and we found the best person to do it," said Coiteux. While he could not say whether Pichet could be reinstated, he did say a successor would eventually be proposed. The Parti Québécois, however, questioned appointing Prud'homme to head the Montreal police. "There was one police force with an unstable administration. Now there are two," said Pascal Bérubé, the PQ critic for public security. "We decided to transfer the director of our national police service to the SPVM. Why didn't we choose a civilian to head the SPVM? It's unbelievable." Is the Montreal police department in crisis? Plante, for her part, said that she didn't see the situation as a crisis, but as an opportunity. Her administration is dedicated to working with Prud'homme, she said, and she hopes to restore the public's faith in the city's police service. "This is the right thing to do because we want to move forward, we want to make sure we can change the organizational culture so that trust for the police force is back." The Montreal police's union said it is offering "its full collaboration to improve the SPVM" and welcomed the decision to suspend Pichet. Montreal Police Brotherhood president Yves Francoeur said it was time that the police force be involved in a process to win back the confidence of the public and of the police officers. Francoeur has also repeatedly criticized Pichet since October 2016, saying that he couldn't lead the Montreal police. "Police officers paid the price for the incompetence and the irregularities of the administration and were bullied by unjustified processes," said Francoeur. The union said it also wants to meet with Prud'homme as soon as possible.